with spring training games right around the corner, MLB Network aired the 4th installment of their 5-part series entitled "Top 100 Right Now" tonight on February 27 at 9 pm EST. 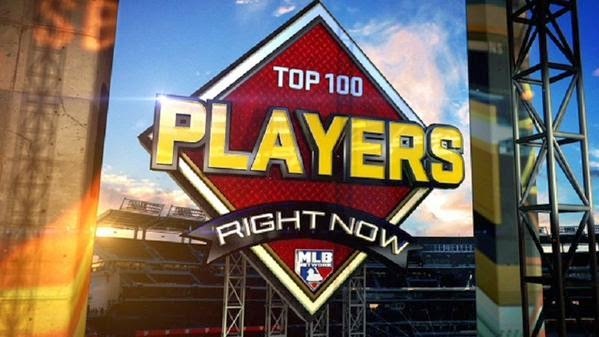 the show ranked the Top 100 major league players currently in baseball going into 2015. Greg Amsinger, Ron Darling, and Bill Ripken counted down players from 100-81, 80-61, 60-41, 40-21, and 20-1 in 5 one-hour specials over 3 days from February 25-27.
this annual list is based on the players' performances over the past three seasons, with a particular emphasis on the most recent (2014). other criteria taken into consideration for these rankings includes projected performance for the upcoming season, defensive position, individual accolades, and the intangibles they bring to game (ex. team leadership). to see Michael in the Top 20 of this list. to my surprise, in his Top 100 debut, Michael was ranked as the 21st best player in the majors right now. i let out a huge gasp when i saw Michael's name on the screen at #21, i gotta be honest. i understand that certain other players should be ranked ahead of Michael, but i didn't necessarily agree with every player in the Top 20.
this is a hard list for him to place really high on because it's all inclusive. Michael, a position player, is having his stats compared not just to all other position players, but to pitchers, too. and both leagues are grouped together as well. it's not an easy task trying to fairly and accurately rank everyone because there is so much talent in baseball. consequently, this list is definitely subject for debate. there were several players left off the list that even the hosts of the show couldn't get over, so take it for what it is. what really hurt Michael here is this: his 2012 and 2013 seasons were just not that flashy. he was still consistent, having the highest batting average on the team and being very clutch, but the power and accolades were absent from his resume. i'm betting that if he puts together numbers in 2015 that are even remotely close to what he did in 2014, then a year from now, Michael will crack that Top 20.
btw, Michael was not the only player representing Cleveland on this list. the 3 other Indians on the Top 100 list include Carlos Santana at #72 (his highest rank ever on this list), Yan Gomes at #56 (Top 100 debut), and Corey Kluber at #15 (debut). congratulations to Michael and the rest of the Indians who made this year's Top 100! the complete Top 100 Players Right Now list can be found here.